David Gessner, Return of the Osprey: A Season of Flight and Wonder (Ballantine Books, 2001), 289 pages, 1 rough map. I purchased this book (along with an alumni sweatshirt) ten years ago at the University of North Carolina at Wilmington’s bookstore. It’s the school where I did my undergraduate work and where Gessner now teaches. I started reading and just didn’t get into it at the time. I put it down after 20 or so pages. Since then, I have read a couple more of Gessner’s books (My Green Manifesto and All the Wild that Remains). Late last month, as I was looking for something to read while I was spending a few days kayaking and camping on Cumberland Island, I decided the try the book again. This time I fell in love with it. There, I spent part of an afternoon on the banks of Brickhill River, alternating between reading this book and watching an osprey fish. Gessner’s prose is wonderful. There is a relaxed tone to the book as he draws us into a season he spends on Cape Cod observing these magnificent birds. This book is part memoir, as we learn about the author’s recent bout of cancer, which he uses to draw us into the story of how chemicals (especially DDT) almost wiped out the osprey population. But they have made a comeback. Personally, I encounter osprey almost every time I paddle out of Delegal Creek, heading to Wassaw or Ossabaw Island. Perhaps these experiences helped draw me into Gessner’s story. As he watches the osprey return from South America to their nesting grounds on Cape Cod, Gessner informs us of the birds’ habits. He draws on experts, such as John Hay and Alan Poole. He also carries on a discussion in his narrative with broader ecological writers including Henry David Thoreau, Rachael Carson, John and Mildred Teal, Wendell Berry and Scott Russell Sanders. He explores the dynamics of his own family. He regularly visits his father’s grave while his mother spends the summer with Gessner and his wife. Also, for shorter periods of time, his troubled brother visits, followed by a more delightful visit of his sister and her son, Gessner’s nephew. Reflecting on his own family allows him to also ponder the family dynamics of osprey. 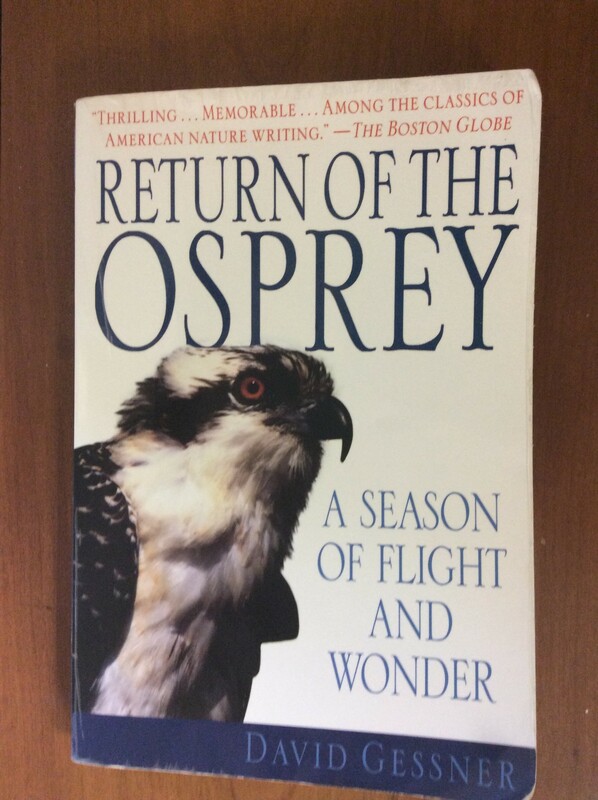 As the book goes from late winter to early fall, the reader joins Gessner in cheering on each stage of development during the osprey’s nesting season. First they select and build a nest, then lay the eggs, then the hungry newborns to feed. As the season begins to wane, the young fledglings’ take to the sky and then, before it is time for them to migrate, begin to master fishing. Ospreys are often called sea eagles and they obtain almost all their food from fish. I was glad, however, to learn that occasional on Cape Cod they will eat an occasional muskrat. I once saw an osprey near my home here come back to the nest with what appeared to be a marsh rat. I recommend this book. It’s great nature writing. It reminded me of Edward Abbey’s Desert Solitaire and Annie Dillard’s A Pilgrim at Tinker Creek, even though both of these authors wrote their stories as if they were living alone (both had a spouse or significant other with them at the time, something I think I learned from a lecture given by Scott Russell Sanders). Gessner, by including his family into his anrrative, is able to take us out of the “lone nature lover” situation to one who, like the Osprey, live lives with others. A good read. Not my usual type book, but it does sound interesting. We have an Osprey at our pond and I enjoy watching it fish. I assume it’s the same one that we’ve seen several years in a row. It’s like an unexpected gift to become fully immersed in a book you’re formerly set aside. Glad that was your experience, Sage. sounds like a very interesting book, I love ospreys! Sounds like a perfect read during your trip! I think I would like the way he included his family experience and also wrote about the family life of the osprey. Sounds like a great book for a bird watcher and nature lover. We have an osprey on one of our variant license plates in Vermont. They’ve made a comeback here, too. Sounds like a wonderful adventure. Chrys, Pilgrim at Tinker Creek is a wonderful book-I read it while hiking the Appalachian Trail and she helped open my eyes to what was all around. Although she doesn’t just focus on nature, another book you might like is Kathleen Norris’ “Dakota” The author and her husband who have lived in urban areas (New York and Honolulu, I think I remember), move to a small town in South Dakota. Great recommendation. I read one of Annie Dillard’s a few years ago but can’t remember if it was this one. As I recall it took some effort but was worth it.